The Ricoh Arena in Coventry, England, is a complex which includes a 32,609-seater stadium, used by Wasps rugby union and Coventry City football clubs, a 6,000 square metres (65,000 sq ft) exhibition hall, a hotel and a casino. The site is also home to Arena Park Shopping Centre, containing one of UK's largest Tesco Extra hypermarkets. Built on the site of the Foleshill gasworks, it is named after its sponsor, Japanese company Ricoh, which paid £10 million for the naming rights over 10 years. 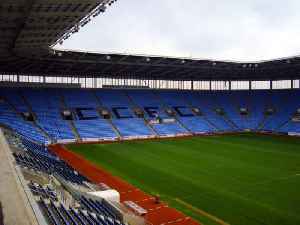 For the 2012 Summer Olympic Games, where stadium naming sponsorship was forbidden, the stadium was known as the City of Coventry Stadium.